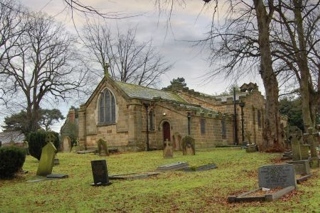 St. Cuthbert’s Church and Churchyard are located to the west of the A172 Stokesley Road in Marton Village. The main entrance to the church and Churchyard is by the Lych Gate which commemorates Queen Victoria’s Diamond Jubilee in 1897. There is an overhead canopy and in earlier days when coffins were carried long distances the bearers would rest under the canopy to afford cover for the coffin. There is a line of trees near the church wall which would be the boundary of the earlier churchyard. In olden days the land to the north of the church and the north boundary of the churchyard was called Devils Side because it was the burial ground of disreputable people. Near to the main path is a tombstone with three coffins each bearing initials carved in stone. The story is that three men stole a piece of meat and threw is down a well, when they went to retrieve it they were overcome by carbolic gas and their bodies found at the bottom of the well. The churchyard holds a great deal of local historical interest, being the last resting place of several well-known former residents, such as members of the Bolckow, Vaughan, Swan and Winterschaladen families. Among the many, was Agnes Spencer, who died 1st March, 1959 widow of Tom Spencer, of the Marks and Spencer partnership. Also of Mary Walker of Marton Grange Farm who died 12th March 1789 aged 89 years. This lady is reputed to have taught James Cook the alphabet and how to read when just a young farm-hand in her charge prior to his move to Aireyholme, at the age of eight. The GPR holds 19 grave and 45 person records for the burial ground.